Synchronous generators | EGÚ Praha Engineering, a.s.
Synchronous generators of the nuclear, thermal and hydro power plants are the main action members of the System of U and Q regulation. They enable continuous change of reactive power (inductive and capacitive) into the regulated system. They enable to enter very small changes as well as big changes in the supply of reactive power. Production of reactive power that sources do not require any additional costs in terms of active power consumed as it is the case of compensation equipment. They have significant exploitable regulatory reserve of reactive power. They are quite equally distributed in the regulated system. Their including into the System of U and Q regulation does not require any special and financially expensive technical changes on the actual synchronous generator and in the power plant. Operation of the synchronous generator under the System of U and Q regulation is the technical and operational benefit for the power plant itself. There is no adverse reaction of the block transformer to change of the reactive power (in contrast to the response of the generator to change of the tap of the block transformer). The size of change of generator reactive power can be calculated very accurately and then quickly and accurately enough realized (in a case of the transformer it is rather a reasonable estimate). There is no negative impact on the lifetime of the synchronous generator technological equipment. Changes in the supply of reactive power can be performed virtually continuously without technological and technical limitations of these changes interval (on the transformer it is necessary to limit appropriately the number of tap changes during the reporting period). 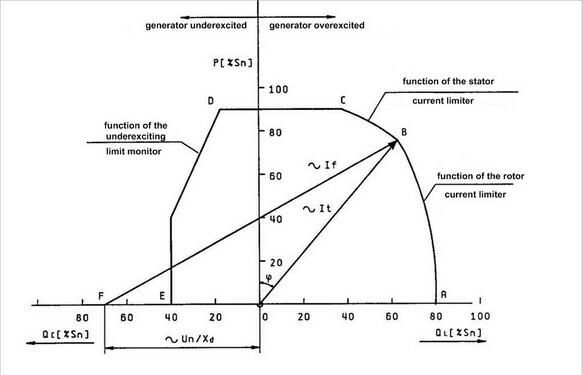 Theoretically, there is the possibility of drawing reactive power of the synchronous generator given by its projected operating diagram (see Figure 1). Setting a guard of the stator and rotor current and a guard of the under-excitation limit. Set voltage limit on the power plant self-consumption. Setting the voltage limitation on the generator voltage. Dependence on the particular electrical power system (network) into which the generator is to be connected, as it has to be performed a calculation or measurement in this area to determine the static stability and according to it to correct settings of the guard of under-excitation limit. Manufacturer recommendations for specific generator. And there may be some more specific reasons for such limitations, which in most cases result from a specific technical condition of the synchronous generator. To determine the real capabilities of a particular regulatory synchronous generator its certification is done, the result of which is an official report issued by a certification authority. It also includes a certified chart (operation diagram) which is then used for technical and commercial representation of regulatory capability of the synchronous generator.